We’re already halfway through Q1, and I’m really glad I’m still sticking around with this blog posting thing! It has been a bit hard, though, since I didn’t exactly follow my January plans as I had wanted to. I did manage to implement a simple marketing plan, put Aurora Hikma on the map as a place that welcomes guest posts, and figure out who is the high-ticket client I’m going to target throughout Q1 before pitching at the end of March. I also managed to book some coffee chats, made some progress on client work, and put together an outline for my beta service launch, but wasn’t able to the cold emailing. I think it’s all because I tried to cram too many things into a few days at the end of January rather than focusing on the goals earlier. 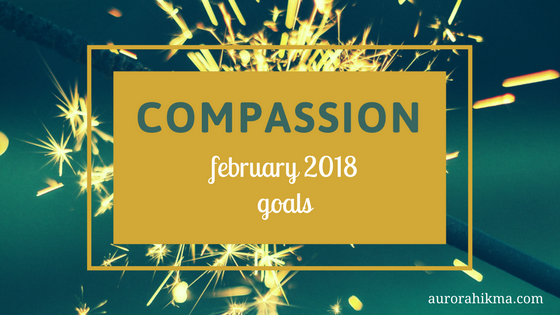 That’s why it’s a good thing I picked “compassion” as the theme for February. Because I’m going to be as self-compassionate as possible and take things slow and easy, but steady. Cold emailing campaign with a total of 375 companies/people contacted. Book projects/sell packages with a total equivalent to what I booked in January. Get paid for at least half of January’s bookings + pay off outstanding payments that were a result of the terrible banking disaster we had over the last few months. Get the #girlpowerhop to at least 25 participants. Get 6 guest post pitches approved/published. Have at least 15 coffee chats. Allocate 15 minutes on Mondays, Wednesdays, and Fridays to interacting with my high-ticket target for Q1. Finish up all outstanding client work + streamline company workflow. Beta service launch plan ready to be implemented. It may seem counter-intuitive to have a larger number of goals, given that I want to take it slow, but some of these are actually things that have so much value, both personally and professionally, to the point they don’t count as “work”. Others are actually small things that just require a few minutes of emailing back and forth, and some are consequences of other goals. To the aspiring overachiever in me, this list feels too simple, but that’s how I’m keeping it this time around. Also, you may have noticed where I talked about #girlpowerhop up there, and you might be wondering what that this. This is a blog hop organized by Aurora Hikma, for the 8th of March, which is also International Women’s Day. On this day, everyone who is participating, will publish a blog post on something related to women and girl power, while staying within the niches of their respective blogs/businesses. It’ll be an opportunity for all of us to learn something interesting about each other’s fields, while staying within the theme of “women”. For example, here at Aurora Hikma I will be writing about a prominent female translator, while someone with a life coaching blog may write about a female pioneer in life coaching, or even give us some life coaching advice in a post tailored to women. Or someone with a poetry blog can blog about their favorite female poet or their 10 favorite poetry verses about women. So many ideas can be tailored to fit this blog hop! Your post must be ready on the 7th of March, scheduled for the 8th of March. 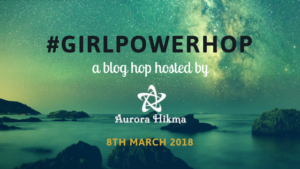 You must include an image at the bottom of the post with some text about #girlpowerhop and a link to a page on our website which will contain the links to all the participating blog posts. You must promote your blog post on your social media accounts, as well as the link that houses the links to the rest of the participating posts. If you’re interested, please fill out the form on this link, and I’ll email you a reminder a week before the post is due!